The Place Botanic Gardens is more than a UNESCO Heritage Site, as it is becoming a dining destination with the likes of One-Michelin starred Corner House, and The Garage which opened last month. This colonial bungalow style dining concept is by the One Rochester Group, the same team behind UNA, Stellar @ One-Altitude and the recently opened The Summerhouse/Wildseed Cafe at Seletar Aerospace Park. Back to The Garage, it is located very near Botanic Gardens MRT station at Cluny Road. Interestingly, this was a real garage in the past, though we are not sure how long ago that was. The ground level is a casual dining concept Bee’s Knees which serves sandwiches, pizza, pasta, pastries and coffee. The second level is the more formal dining restaurant Botanico, a Spanish concept which changes its menu according to seasonality. We checked out Bee’s Knees during the weekend, which has a nice alfresco dining area where you can literally dine amidst nature. Otherwise, you can also choose to settle for the indoor seats. The Food We started with the Flat White (S$4.50) and Latte (S$4.50) , which leaned towards the acidic taste. The Truffle Carbonara Pizza (S$26) we had is a huge size for two to three pax to share, with faint hints of truffle and topped generously with bacon. We also had the Serranito (S$14) sandwich served with chips, filled with salami, cherry tomatoes and Brie cheese. The melted cheese is the winning ingredient here, though we wished that it was served warmer. This Spanish style sandwich is apparently quite popular in Seville. Rants We noticed that the service can be stepped up, as we noticed some customers’ queries about the menu not being attended to professionally. Then again, it all takes time for any new establishment. Will I Return Again? 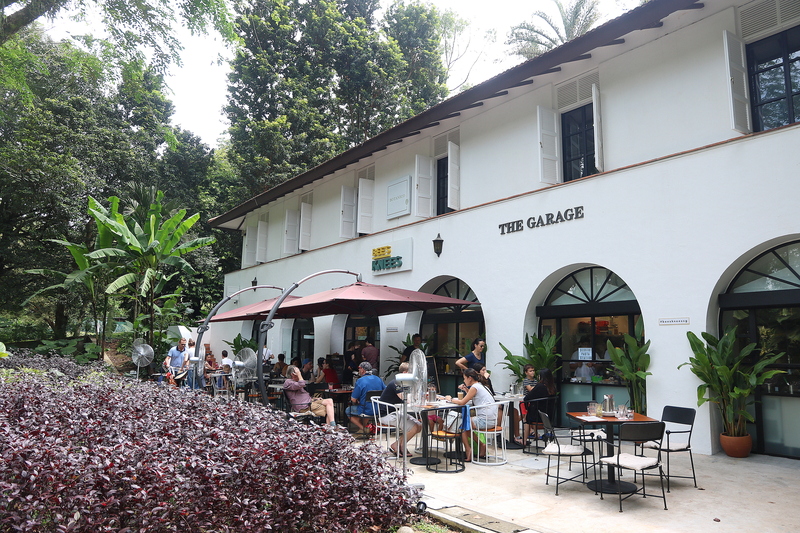 The Garage is definitely a nice addition to the dining scene at the Botanic Gardens, especially Bee’s Knees where you can get your coffee fix, or have a sandwich or pastry after your leisurely walk. The space is a relaxed and casual ambience within a beautiful national park we have in Singapore. We can’t wait to check out Botanico next, or simply take a stroll in Botanic Gardens.